These two talks, especially when seen together, speak so well about communication and the value of real education. 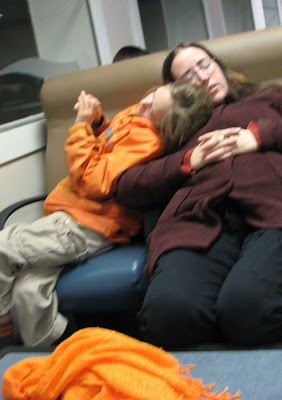 In these are the foundation of my belief in unschooling, as well as in my support of the Occupy movement. Bunker Roy speaks about his barefoot colleges; the wisdom of valuing experience and knowledge over college certificates. Anupam Mishra talks about centuries-old water-harvesting technologies in India, and how these, as well as the widsom, sharing, and community they engender in the communities who built, use, and maintain them. I've often felt guilty for being a daytime-occupier -- just dropping in for visits, getting reports from Markus (my husband) who works nearby, and stops in to listen to discussion groups, etc. sometimes during the days he's there. I felt like I should be there overnight, too, if I wanted to really support the thing -- and I do! So off we went, for one night only (my parents generously look after our animals, but we do have a wood-heated home, here, and there is no way I'm going to allow it to mold away in my absence by spending too much time off-island). It wasn't as amazing as I'd hoped, but I'm still glad we went. The kids and I arrived when it was dark, and Markus had already spoken to people from the tent committee about where to put our tent. They even brought in pallets for us to set up on (to keep drier). Then we set our camping gear aside, and were given a tour of the current grounds by Selena (I think!). Somebody from the fire department told us that they've prohibited more tents from being set up, but there was no way were going back home at that time in the evening (too late for the last ferry), so we set up anyway. They never complained. Our set-up: the 3-man tent we got for our wedding, with our flag draped over it, both for identification and for style! It also helped keep some of the street-light out. Inside we had a thermorest, a double-sleeping-bag for 3 of us, and a separate bag for Rhiannon, who monopolizes too much of the bed to be able to share with us. We had a plastic tarp waiting for rain, but didn't end up needing it, and donated it to the infrastructure tent in the morning. I don't know what came over me, but I was extra shy, and basically avoided the two interviews Markus had told people I'd do. I also managed to forget to take photos of all the wonderful infrastructure that's cropped up in the past week. I'll blame in on dark-moon introversion. *Note to non-lunatics: The dark moon (just before a new moon) is a time of low energy, letting go, and introversion. Many women's cycles naturally settle into a pattern of dark-moon menstruation; children are often noticeably quiet or irritable at a dark moon, and sometimes situations that might otherwise have an obvious solution can seem insurmountable. Anyway, either I or Markus will hopefully get some better photos up here in the next few days. Among the great new presence we didn't photograph were a library, including a children's section (Rhiannon was thrilled! 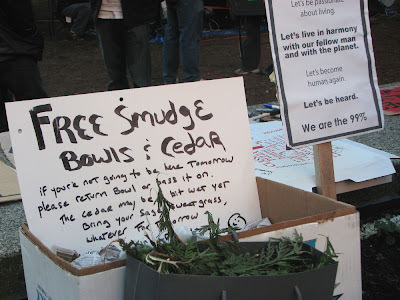 ), a tea house, a dishwashing tent for the free food provided (by donations to) Food Not Bombs, a spiritual/creativity dome (in progress), an art-tent for sign-making but also for other inspired work, and a tent over the main stage on the steps. There wasn't much going on. 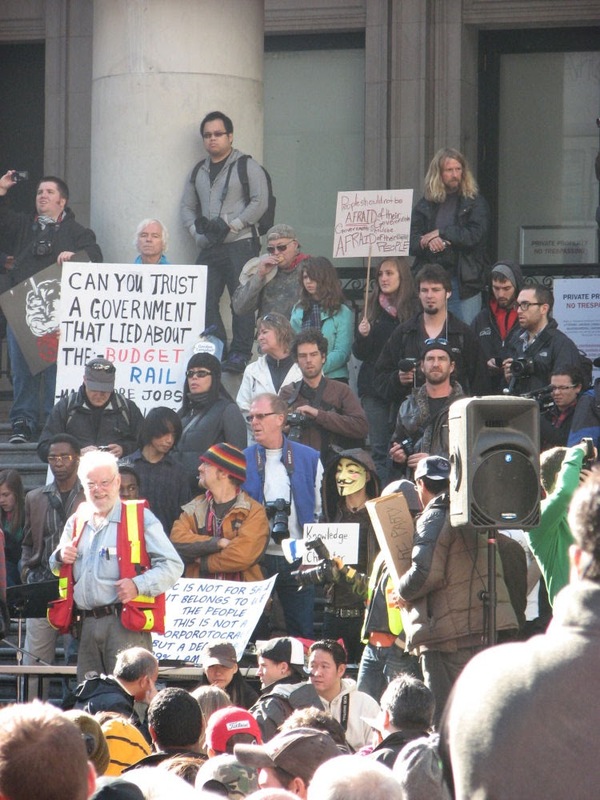 The protest march which we'd hoped to participate in (Occupy Kevin O'Leary) never happened, at least in part because the VPD had over-prepared and sent out rather offensive-looking troops. None of us wanted violence or trouble, so we just didn't go. Others didn't go because there seemed to be nothing happening! The place had that slightly irritible, forboding dark-moon energy, and just wasn't all that exciting. Maybe Tuesday night was not the night to have chosen! We had some veggie soup and rice from the food tent, and eventually just went to bed. As luck would have it, no sooner had all four of us taken off our boots and coats, and snuggled into our very cozy little tent, than a lovely music gathering began, outside. We were too tired to join, so just lay there listening to the drums, guitar, klezmer accordion, and random conversations of passers-by until finally exhaustion won out over city noise and lights. I must say we had a hard time sleeping, though. We are used to a home where the only night light comes from the moon, and our far-off neighbours are also quiet. 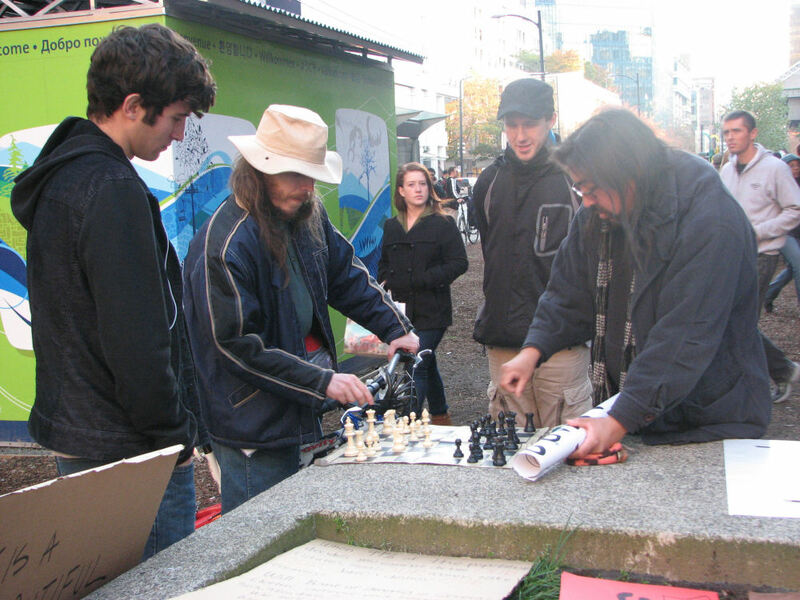 Sleeping between the well-lit Vancouver Art Gallery and one of downtown Vancouver's main thoroughfares -- never mind that it's also currently an Occupation -- is rather a different story! The noise of people passing by on foot, and in vehicles was constant, and the general rumbling of the large city was felt as much by our bodies as by our eardrums. But the light was something else! Markus and I probably checked the clock about 10 times in the 8 hours we lay in the tent, each time thinking that it was light outside, and then realizing that, no, it was still just the streetlights.... Ah we are so spoiled, here. So in the morning we got up, managed to pack up our tent before it got too wet in the rain, Markus went to work, and the kids and I headed back for some breakfast. On offer Wednesday morning was porridge, chili, rice (leftover from the night before), fruit, and various breads, peanut butter, and juice. The fact that there were two meals my gluten/soy/egg/bean free kids could eat was pretty exciting! But Tal was feeling a bit out of sorts and declined the hot porridge in favour of the raisin-bread we'd brought along, ourselves. This experience gave me a lot to think about, in terms of the value of occupation in the global movement and the evolution of the revolution, so to speak. 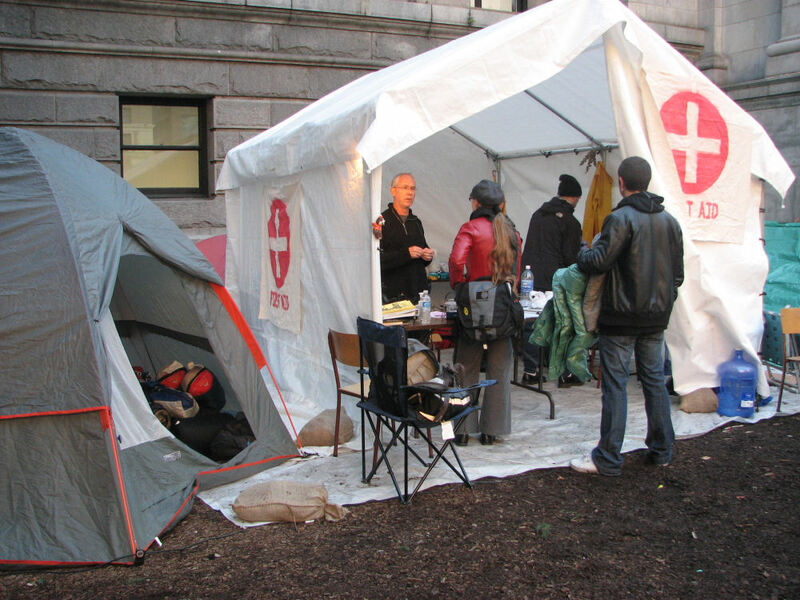 The Occupation has of course attracted a large number of homeless and other marginalized people because of the availability of free food, free shelter, and (I think importantly) social support and acceptance. Inclusiveness being a large part of what the movement is about, it`s perfectly reasonable, and a good thing. Especially because these people need a voice. too. But it also means that many of 'the 99%' seems to distance themselves from the movement, when they look and see what appears to be a "squatters'" encampment. There's also the issue of money. Vancouver spends a lot of money sending police, fire crew, and civic officers down to patrol the site, while these are not necessarily needed (Occupy has its own security committee, under the heading 'peacekeeping', at that webpage), and certainly not in the numbers they're present. This unnecessary expenditure angers taxpayers, who not only resent the money spent, but also seem to often assume that the occupiers are not tax-payers, themselves. On City Caucus I read that CKNW's Bill Good stated: "Occupy Vancouver has been reduced to a handful of young people clearly out of step with mainstream society." While Mr. Good may be clearly out of step with the movement, I can see why he came to that conclusion. While we were there we witnessed a couple of outspoken people so passionate about their causes that all common sense seemed to have left them. (Guess who was being filmed by the news crews?) There were also a few people with various developmental or social problems, using the stage to voice their thoughts. 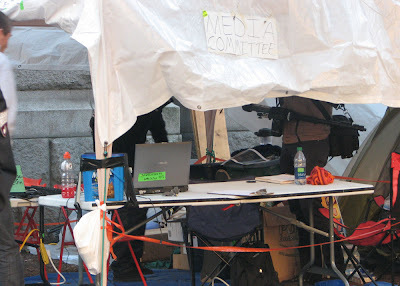 And I wondered if it was just a mistake or a calculated effort that CBC was there looking for interviews at 8AM Wednesday morning, while most of the service tents (infrastructure, library, media, etc.) had not yet opened for the day, and only about 15 people milled around, in various states of sleepiness. Perhaps Mr. Good came out at the same time. The question is: do we need to camp, to support the revolution? Obviously, the camping makes a clear presence, and keeps the movement front-and-centre on the main streets of our cities, and it's also ensuring that some of the social infrastructures and systems that will be a part of the change we're making have a space to blossom, right in the hearts of our cities. But I would argue that that blossoming has been happening in various small ways, already, and that perhaps we can keep a presence without requiring so many of us to camp out on the grounds of the revolution. We need a central place from which to feed and catalyze the revolution that's already happening; we don't need to centralize everything to the occupation grounds at the cost of our own wider communities. I know that's a very controversial statement, and I'd be glad to have comments, here, on this. At the moment I feel that the benefit of the tent-cities is threatened by the image they're creating. The infrastructure is good and productive, and obviously a certain number of people need to be there to maintain and protect it during the nights, but I think it would be more productive for the rest of us to save our energy and time, and put more energy into the daytime occupation. When I participate in the marches, the meetings, and discussion groups; when I talk to people about life and art and science and humanity; when I drop off a donation or wash some dishes at the food tent, or when I browse the interesting information in the library, I know I am making a difference. I meet many intelligent people who have many interesting things to say and inspirations to help build our new reality. It feels right. But in the early morning, listening to a handful of people with really nothing constructive to say, embarrassed for knowing that the TV cameras were filming this as the face of what many perceive to be a failed revolution, I couldn't say that my sleeping there had made any difference at all. Our family (and quite a few others from this island) will head over to Vancouver this weekend again, and I know it will be meaningful and good. But when the day is done, I think we make more difference by taking the revolution home into our own communities than we do by sleeping on it in the loudness and the brightness of downtown. After all, we're having an election here, too, and I can't vote for Vancouver councillors, whether they call us squatters or not, but I can vote for people in my own community, and that matters. The security committee is seeking volunteers for 3-hour shifts (9pm-midnight; mid-3am; 3-6am) and there will be a sign-up board on Saturday. More information about responsibilities will be available on-site. Occupy Vancouver (O.V.) is a non-violent movement for Social, Economic and Political Change, officially starting from October 15th, 2011, and will adopt the following policy with regard to Safety, Security and Civility Issues. 1: Politically Motivated Violence (eg. property damage). O.V. does not endorse any form of political violence. In the case of any politically motivated violence O.V. participants will, to the best of their ability, attempt to physically distance themselves from the incident and keep themselves safe. 2: Personal Verbal Abuse, Personal Physical Abuse (actual or threatened). O.V. as a community and movement will not tolerate personal physical or verbal abuse, actual or threatened. It is the policy of the O.V. to advocate calm and peaceful methods to resolving disagreements. Additionally it is the responsibility of all O.V. participants to help maintain and/or restore a peaceful environment if need be. I think this is the most important speech of my lifetime. It's long (20 minutes), but very much worth watching. THIS is why I teach. For joy! Rhiannon sticks up for herself. We spent most of Oct. 15th at Occupy Vancouver. Because of commitments on our island (a wood-heated home, pets, and the children's various activities), we won't be camping in Vancouver, but we do intend to spend a day there every week or so. 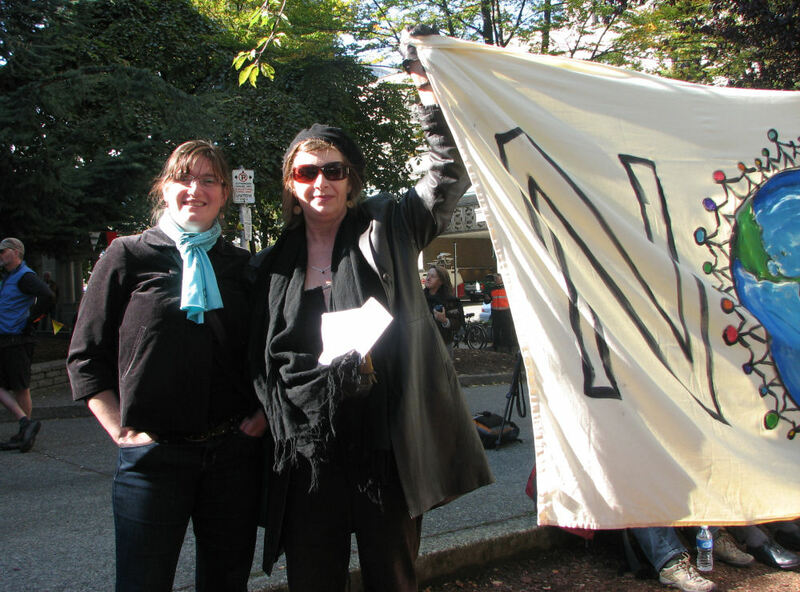 We had a few reservations about the event, because we'd had so many warnings from people re: police violence, black bloc violence, angry protesters, etc. But there was none. A few people commented supportively on the fact that we had our kids with us, and they were far from the only children there (although the children's area wasn't very well-used). It was, I think a fabulous learning experience for the kids, and their level of engagement even surprised me. Taliesin said on the way into Vancouver that he didn't really want to go, but then seemed to be fully participating, throughout (this is a boy who NEVER does things he doesn't want to do, especially if it might lead people to believe things about him that he doesn't really feel). He held up his "let us eat real food" sign to the cops' faces, waved and smiled at them. He sat and listened to speakers and meetings. This boy who sometimes hides in corners in a class of children came right out of his shell, spoke to strangers, crawled around people to get a better seat at the meetings, and afterwards told me that he "felt comfortable, there, like with those people who were loving and friendly. Like at Uncle and Ginger's wedding." It was kind of amazing to me to see this transformation. This is a boy who is utterly unconfused about who he is, in the moment. Sometimes it just takes us parents some time to get with his program. Rhiannon has no comment other than to say "it was nice", but did make herself a lovely sign. No input from us, of course... That red printing says: "What if the world was one big mounten." I'm not 100% sure what she meant by that, but somehow I think I get the gist of it. We were so worried about the post-riot VPD and their new MRAD (Medium Range Acoustic Device, which can be used as a sound-weapon to disperse protesters), that we brought along ear-muffs and plugs for the kids, but there was no need, this Saturday. There was one arrest, which may have been much more harsh than necessary, of a woman who had driven her car up onto the sidewalk. I'm not sure what happened, there, so I'm not going to speculate. What I did see were dozens of police men and women lining the perimeter of the gathering, smiling, talking with each other and with occupiers, nodding at and thumbs-upping various signs, and waving happily at anybody who was nice to them. This reenforced my thoughts that the police, like bankers, lawyers, salesmen, etc. are also members of the 99%. I used to think they might not know it yet. I'm now reminded that many of them actually do. The group was so diverse. A friend mentioned to me that "the vague people they have on CBC are really discrediting the movement", but that is obviously not for lack of intellect at the gatherings. 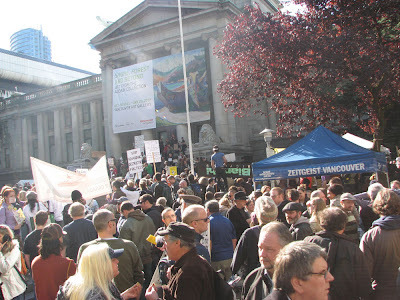 This crowd of an estimated 5000 seemed to have a high percentage of intellectually inclined people, and there was progressive, productive discourse going on everywhere, between people of all ages, genders, political leanings, and walks of life. Click on the photo above for a closer look. 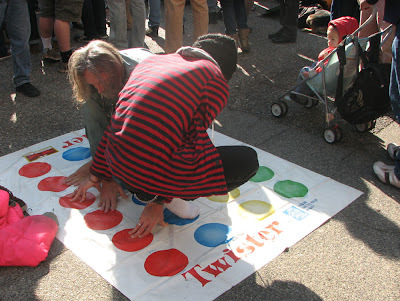 So did less cooperative, but equally thought-provoking games. People had many important things to say, both on and off mic. The mic was open to everyone, and the crowd was interested, engaged, and kind. Conversations around the occupation ranged from all the many various political and societal issues that brought people here, to the future of the Occupy movement, to how to maintain peace with cops and other protesters, to where to find a toilet, etc. etc. etc. Leaving the site? Drop off your sign! Need a new inspiration? Pick one up or make a new one at the sign-making station!! We went to donate some earplugs to the medical tent and found a small lineup of people, a woman being treated for an injured knee, a growing collection of supplies, and a couple of very good people putting their skills and compassion to good use as they ran the operation. We will not be without doctors in the new reality! And our spiritual needs will of course also be looked after. Click the photo to enlarge and read the signs. General Assemblies: GA's. 3 per day, at noon, 4PM and 7PM. There is an agreed-upon set of hand-signals for the Vancouver Occupation, and even if you think you are an unknown bystander standing out in a crowd of 5000, your opinion matters. Your fingers wiggling in the air means you agree. Your rolling fists mean you have a related point you'd like to add to the conversation. Your thumbs down means you disagree but will not stand in the way. Your crossed fists means full block; you'll leave the movement if the proposal goes ahead. We work on consensus, and YOUR VOICE MATTERS. We participated in the pre-GA meeting, on the other side of the Art Gallery. There were a few friends in the group, as well, and we felt good to be in good company. This is where the hand-signals were discussed, refined, and agreed upon. There was no policy discussed, here. Just how to make the GA and occupation successful, inclusive, and peaceful. I was worried that the kids would be bored by this meeting, but Tal, at least, was captivated, and sat totally enthralled, soaking in everything that was discussed. 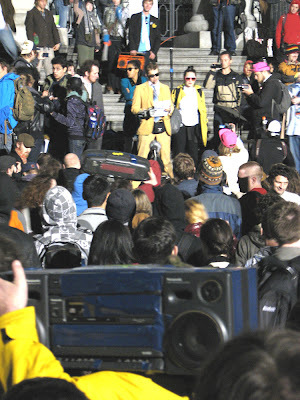 This man (ashamedly, I've forgotten his name) brought his "decentralized sound system" to use. 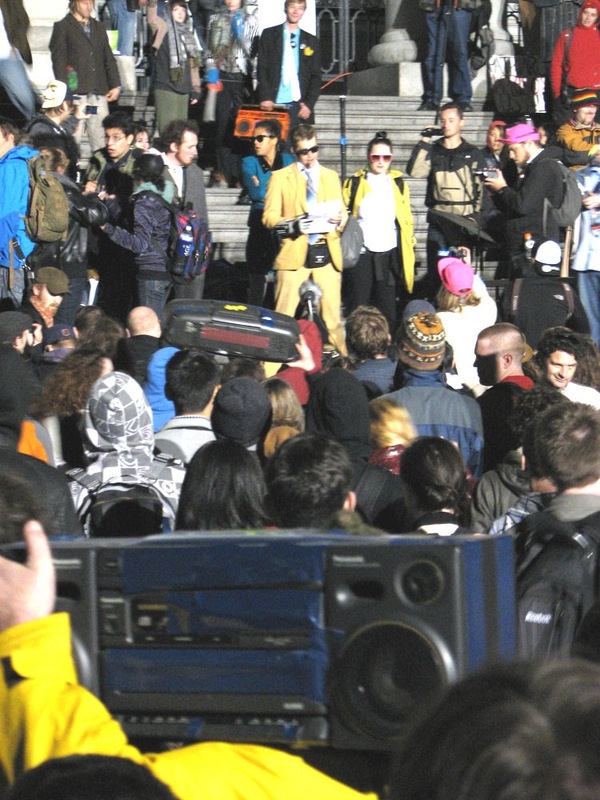 It involved transmitting sound via radio to many different tuned-in ghetto-blasters, which were carried into the crowd by participants. I liked the idea in general, but as he spoke, I realized that it is not at all decentralized sound. It is, in fact, particularly centralized, as the voice of the one person with the mic booms out across the crowd, and no other voices are heard at all. I far prefer the human microphone system, where the speaker shouts 2-5 words at a time to the group, and those who can hear shout them back, thus amplifying the sound for everyone else. It's a very organic method, and when we participated in it we were much more aware of what was being said (because we repeated it ourselves, word-for-word), and we were much more engaged in the discussion. Also, unlike electric-amplification, where a person can speak as long as s/he wants, the forced brevity of the human microphone encourages a great clarity of thought and purpose. I can see that, for speeches such as those presented between the GA's, the sound system can be a benefit. However, for GA's and other group-participation purposes, the human microphone is still it! As the evening got cold we had to head out for the last ferry home to our (cold) wood-heated house and hungry animals. We will not be camping in Vancouver. In fact, after having been actively engaging in the city for 13 hours, we were REALLY grateful to have a warm and soft bed to get home to. But we're also very glad we went, and I think we're all looking forward to our next day, there. Thank you, everyone, for this wonderful first day of a beautiful new way of living! We'll be back again in a few days! 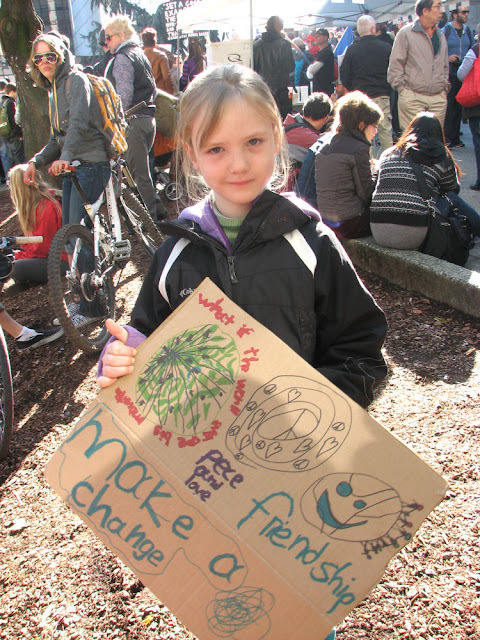 In a few days I will bring my children to Occupy Vancouver. 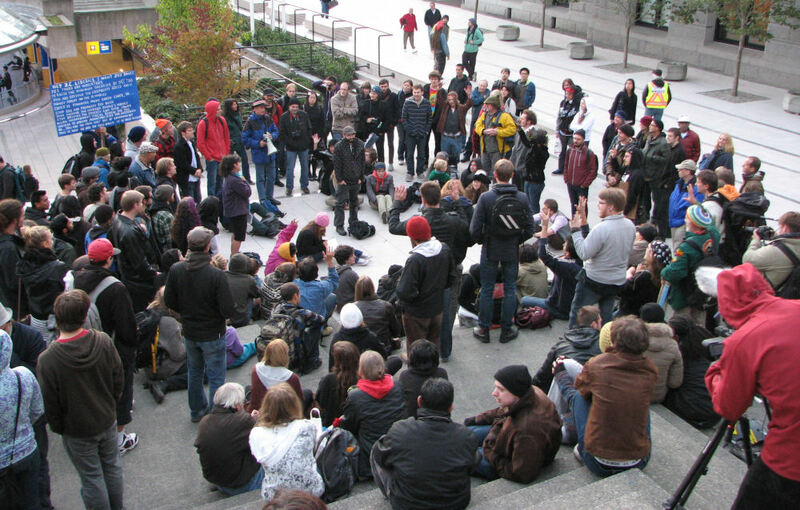 The Occupy movement is about decentralization, and Unschooling is a huge part of that, so I want to discuss my thoughts about the whole thing, here on this blog. WHAT'S THE POINT OF THESE PROTESTS? We live in a highly centralized culture, and we are finally feeling the sting of that culture as it eats away at the core values and resources we need for life. We can debate and protest all we want within those diverse smaller issues, but any progress we make will be stifled by the centralized power we exist under. The only solution is to decentralize – which requires a great, massive 'coming together'. There is already widespread unhappiness with 'the system'. People talk about the 99% taking back the power from the 1%, but I don't see it as being that adversary. The benefit of the occupations is to coalesce, and to reach the 98% who don't realize they're a part of the 99%. If 99% truly stepped away from the trap we live in, the 1% would probably join us, too. It's all about togetherness, as I said. Things like democracy, equality, and understanding cannot be reached without togetherness. 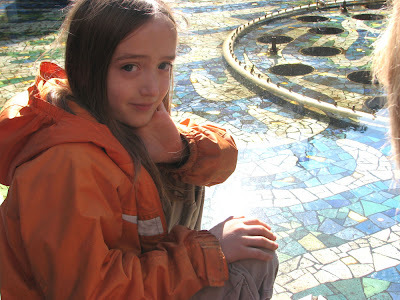 Unschooling, and other methods of decentralized learning and living are increasingly popular, with communities growing all over the world where progressive thought and action can flourish. My kids are completely unschooled, and have been for 3 years, now. The number of unschooling families joining us seems to grow exponentially, and the large conferences of like-minded unschoolers seem to be growing, too. And for this reason I think it's essential that we allow our children to occupy our cities, too. It's their future, and they should be a part of it. "Free children are not easily influenced; the absence of fear accounts for this phenomenon. Indeed, the absence of fear is the finest thing that can happen to a child." There is a growing movement of decentralized food (local food, homegrown food, raw food, unmedicated food, small farms, raw milk, etc. etc.) This is the beginning of what will hopefully be a complete overhaul of 'the system', and reach its arms out to encompass and encourage the healthcare system, as we all head for the care we need, as opposed to the care that the government pays for. Much of that happens outside the hospitals, and I think we're a much more educated society than we were a few decades ago; more of us know how to look after ourselves, and healthcare gets decentralized as we become less dependent upon the hospitals to care for us. Although I don't support privatizing healthcare, the freedom to choose our care (or not) will give new ideas and technologies space to grow. Who writes the history books? Who shapes the past and the future? 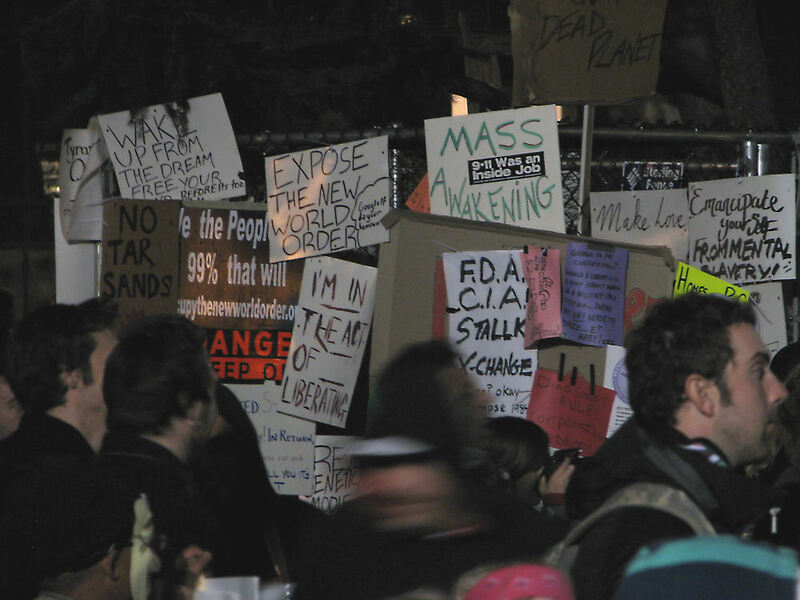 Occupy movements are also a perfect example of how the centralized media are not working for us, and how we can make our own, decentralized news-sources. We've made them already: Social Media. As we render useless the current systems (mainstream media, etc. ), copyright issues and other such problems will sink away in an open-source social system where we all have voices, and the right to know anything we choose. There is, to me, little point in marching through districts where the super-rich live, or in using combative language/behaviour against those who seem not to support us. We are in this together, and in the end we want those who are now against us to feel welcome in our new reality. Further, we can't forget that each individual police officer, polititian, and CEO is also a part of the 99%. It will be a beautiful day when they begin crossing the line they draw. 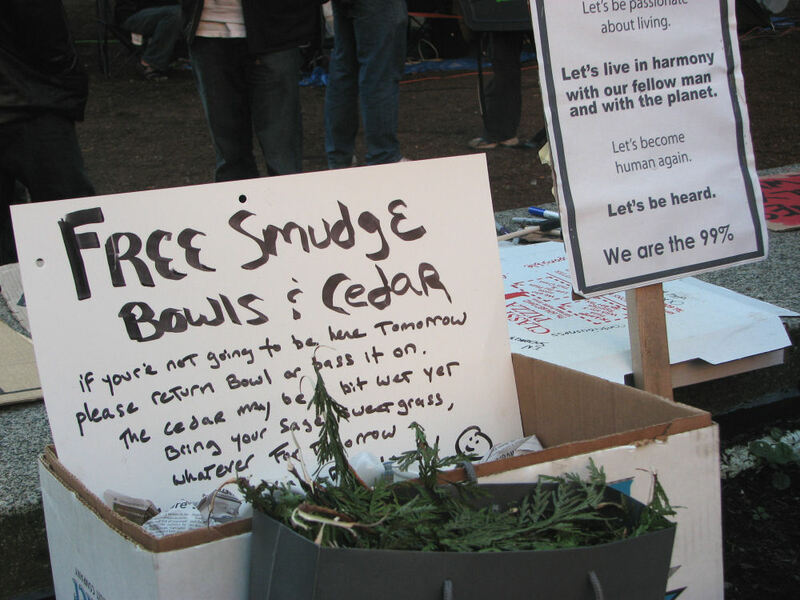 Most of us have one or a handful of big issues that we've been concerned about for a long time: salmon, indigenous rights, education, food freedom, financial integrity, etc. etc. And all of these things are important. So bring them! But remember that this is about decentralization, so we don't want to centre our attention on one issue. We need to forge this change from the top down. We must co-create a new human policy, and then we will all bring our issues to the fore, and talk about them as humans with a common interest of finding peace and equality. Iceland recently had a revolution (if you didn't know, don't be alarmed; neither did most of us! It wasn't covered by most mainstream media.) The people reclaimed their power, and wrote their own constitution, collaboratively, transparently, online. When Canadians reach that point, that will be the time to hammer out the details that concern our many separate issues. Yes!!! This is where we break free of our definitions and find a new reality. I think that the ideas of those people who don't believe in democracy will be instrumental in our communal development of a new definition of open-source, communal governance. Maybe it won't even be called democracy. The whole notion of democracy implies that there are other ways. I think when there is true agreement, we won't be pitting our various viewpoints against each other but will instead have a new way of conversing. Surely there will be plentiful disagreement, but our progress depends upon our finding harmony. There's no point. 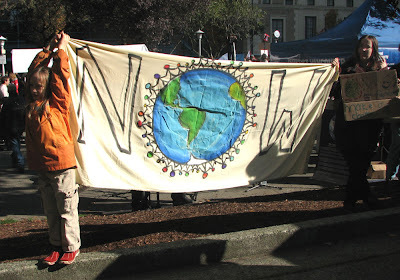 We are gathering not to accuse or to blame, but to find better avenues for conscious living. What this does is give us the chance to be together, to share, to support, and to make change. Ultimately we make the changes in our own individual ways, but in doing so, and in community, we encourage and empower others to do the same. Quite simply, because we're not in such dire straits – yet. But I think the sense that we could be is growing urgently, especially as we watch our federal government wheel us closer and closer to US policy, culture, and affiliation. We need to reclaim our voice and power, before they take us too far over that threshold. So my family is making changes. Arguably, we've been making them slowly, for a long time, as we've chosen to eat organic and local food, drink raw milk, unschool our children, participate as a whole family in community changes and events, not give Christmas gifts, and garden. But feeling the support of the Occupy movement, we've now extended the no-gift-giving to the rest of our family members, telling them that we will not be giving gifts this year, and will refuse to accept any. We're assessing our options for going fully off-grid (not wanting to be dependent upon a hydro company that has no interest in its' customers' wishes), and we're cashing in our savings, paying off our debts, and going credit-free. We're also considering changing banking institutions, to support our tiny local credit union. We've stopped attending classes that require us to drive across the island every week, and now that our children can ride bikes, we can do more outings by bike, making our gas-powered vehicle less and less necessary. And we intend to raise chickens, sustainably. Getting out of the system is REALLY scary to some of us. (No hydro? No schools? No Superstore?) But if we work together we can find ways to develop the new communal/open-source infrastructure we need. "The solution's here! The solution is public understanding! The solution is explaining the difference of the 99% and the 1%. The solution is to explain practically what can be done! What we need right now is a massive social understanding. It's starting here; it's spreading around the country." So the actual gathering -- the Occupation -- works by bringing people together. It's a place where we can share ideas, support each other, and also be a beacon for those who need a light to follow. Hopefully it will continue to spread online, to reach those who don't live in the large metropoli. And most importantly, it makes the issue visible, so that people can see the potential for change, and can realize that they, too, are part of the 99%. Join as you are; know that we all have our own causes, and let us be one voice for humanity. I watched it many years ago, before I knew what unschooling was, and then I thought it was a beautiful story of a brilliant boy who had to circumvent his parents' efforts at steering his life, because they just didn't understand. Tonight I watched it with my son. I was wracked with guilt at seeing the parents trying as I have to shape and direct their son, when really all he needed was to be left alone. At a bathroom break, my husband confirmed that it was a good thing we were watching this again. And throughout the movie, my son continually wiped tears from his eyes. At one point I wiped one off for him. He said it wasn't a tear; it must have been water from my finger. And I said "it's OK to be sad." "OK then", I said, "but for whatever reason we sometimes feel emotional or just randomly find tears falling out, and it's OK. It's normal. You don't have to hide it". I said then, "Do you just wish I'd shut up right now?" He smiled. "Yes but not so rudely." During the credits, I asked what everybody thought about the movie. Rhiannon said "nice!" and Tal said "it's so real." This is one of those movies that we all need to watch. It says so much about acceptance and individuality, but mostly about parenting: our need to let our children be who they are in every moment. Somebody I only faintly know announced yesterday that she'd pulled her son from school and will be unschooling. This sent me on a brain-journey, back through the choices we've made, I re-watched Ken Robinson's second talk, talked to my husband about it, and started to feel the joy of our existence a little more, again. We are SO blessed. We live in a community of many varied people, most of whom are kind, compassionate, and forward-thinking. We have the ability to stretch out into the forests, oceans, and cities, and to allow our children the freedom of their imaginations. It's just so lovely to sit in this dream and revel it, once in a while!! "Had I the heavens' embroidered cloths, enwrought with gold and silver light, of blue and the dim and the dark cloths, of night and light and the half-light, I would spread the cloths under your feet. But I, being poor, have only my dreams. I have spread my dreams under your feet. Tread softly, because you tread on my dreams." "And every day, everywhere, our children spread their dreams under our feet. And we should tread softly."